It's the beginning of the new year, which means that CES 2016 is underway. 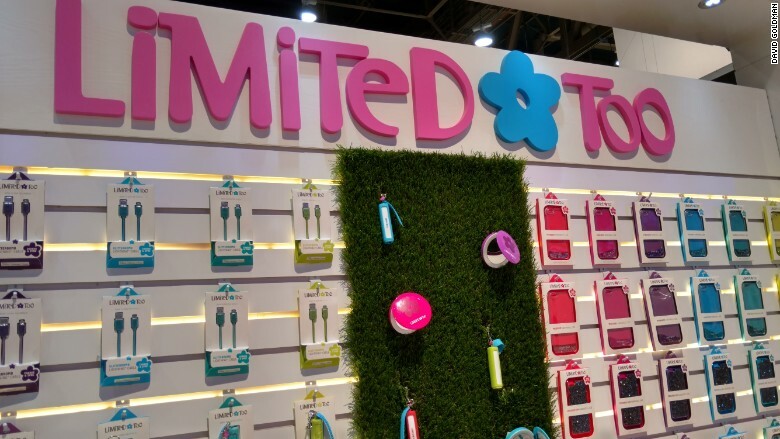 The world's innovators have gathered in Las Vegas once again for the premiere technology expo. This year, 3,600 presenters are exhibiting gadgets, software, services and innovations that they believe will take off in a big way in 2016. 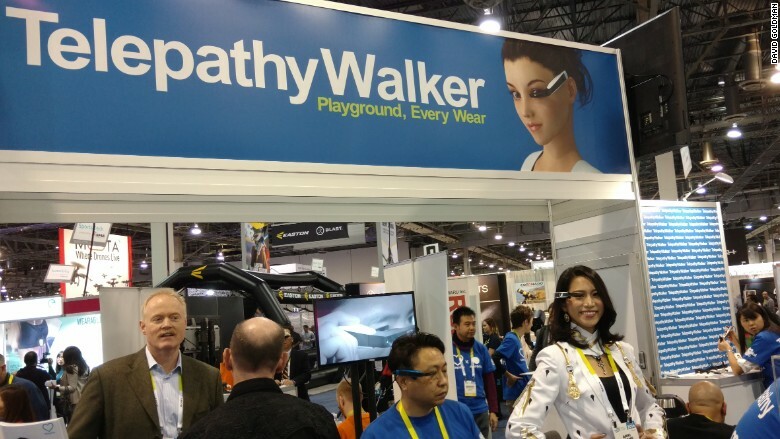 Like every CES, there will be a mix of amazing, intriguing and downright ridiculous technology. Here, you can check out the highlights -- and low-lights -- as CNNMoney catalogs CES 2016. 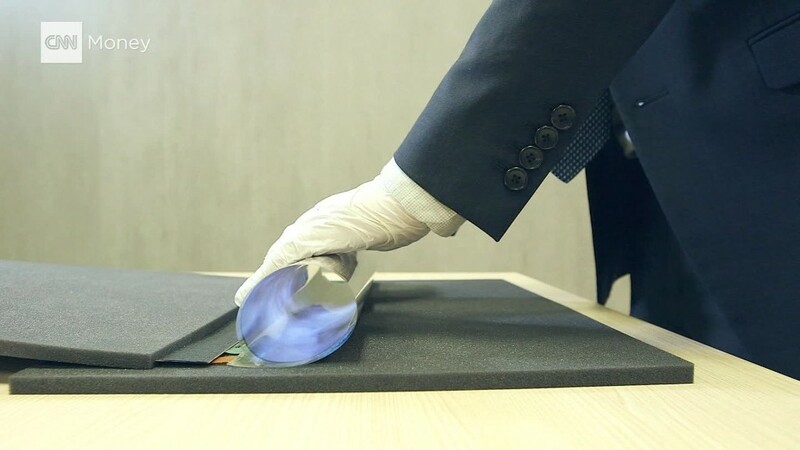 Transparent TV technology has been around for a few years, but Panasonic's prototype caught our attention this year because of the way it can fit into your decor. The wood frame around the TV shoots micro LEDs onto the glass when in use. When the screen is off, the glass becomes transparent. TVs take up a lot of wall space, so it would make sense to have a display that could disappear when you're not using one. Sphero's BB-8 Star Wars toy has been on the market for a few months, but until now you could only control it with a smartphone or tablet. Now you can control it with the force. Well, with gestures that are picked up by a wearable wrist band that connects wirelessly to the robotic toy. Wearing Sphero's Force Band, which will go on sale in the fall, you can send the Droid moving in a particular direction with a wave of your hand. 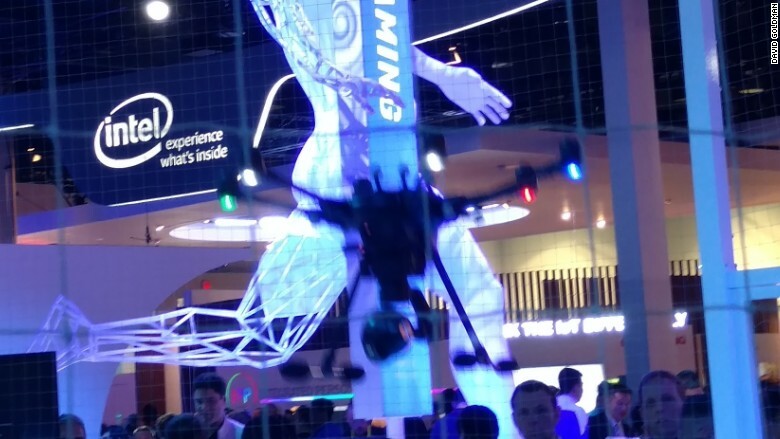 Using its new Real Sense camera technology, Intel demonstrated a drone that automatically avoids obstacles in its flight path. The drone can adjust to an obstacle in nine milliseconds -- faster than your reflexes could signal the drone to move. With airlines frequently complaining about drone strikes, equipping drones with Real Sense technology could save a lot of headaches -- for airplane and drone pilots alike. 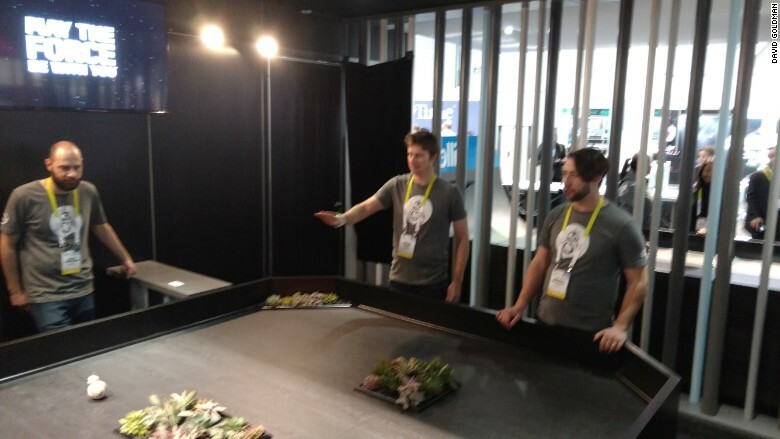 Panono lent me its amazing 360-degree camera, and I snapped a panoramic photo at Sony's impressive booth. I know absolutely nothing about photography, so you can believe that Panono made it dead-simple to take stunning panoramic photos. For a photo to come out that clear and crisp on my first try is really something. 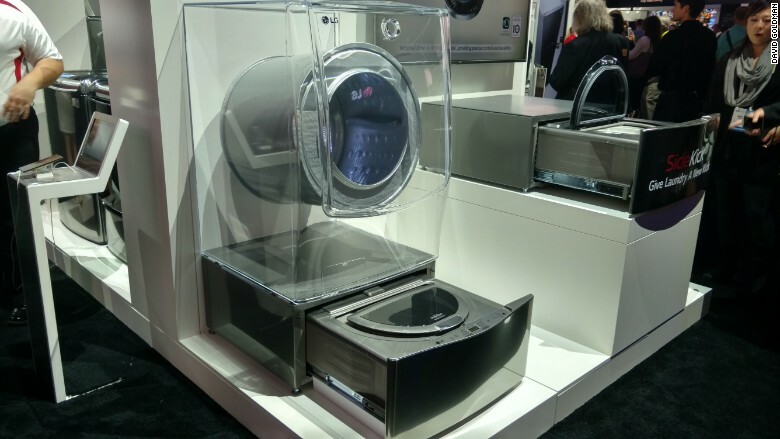 For all of LG's crazy ideas for the future -- roll-up TVs, robotic vacuums, TVs with back to back screens -- I was most impressed with its Twin washing machine, which does two loads at the same time. You put your biggest load of dirty laundry into the main washer, and below there's a separate, smaller washer that pulls out like a drawer for the second load. That way, you could do your delicates at the same time as your regular wash, and you wouldn't have to wait for multiple loads to finish. People who need to wear ear protection at work typically perform repetitive tasks that can lead to boredom. 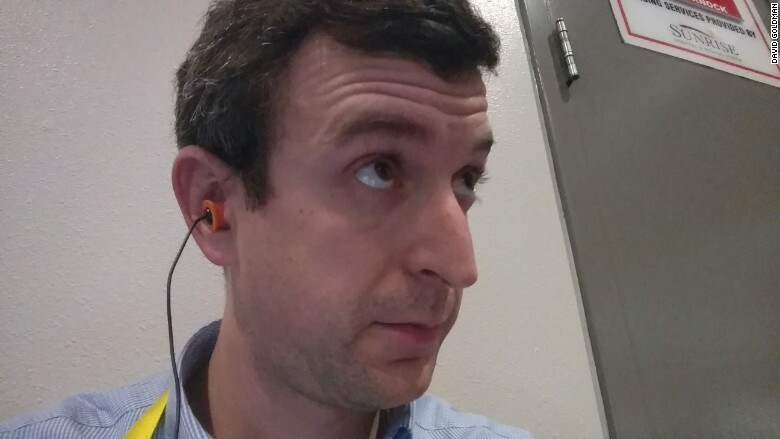 Unfortunately, you can't wear headphones and ear protection at the same time. Plugfones represent the first solution that serves both purposes -- they're certified to reduce noise by 25 dB, and they're Bluetooth earbuds. I could have used a pair of these when I lived in the Lower East Side of Manhattan and drunken NYU students were screaming at each other at 3 in the morning. Remember when RCA was among the hottest tech companies on the planet? There were about four people in its booth when I took this photo. 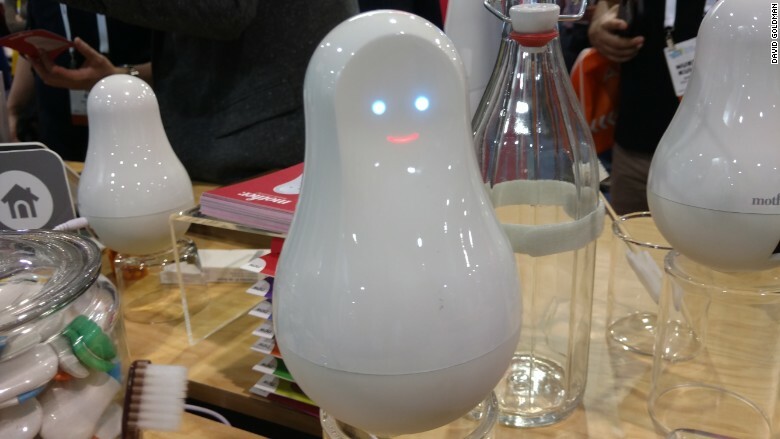 Mother is a peanut-shaped robotic sensor hub that watches over you and your family. It measures how well you brush your teeth, it knows how much you drink and it watches you when you sleep. The idea behind Mother is that you can have everything in your home constantly monitored. Affix a sensor to your door, and it's a door alarm. Put a sensor on your grandmother's pills, and it will tell you if grandma is taking her medications. Put it under your pillow, and your sleep habits get tracked. That may or may not be something you're interested in. But man, is it creepy-looking. 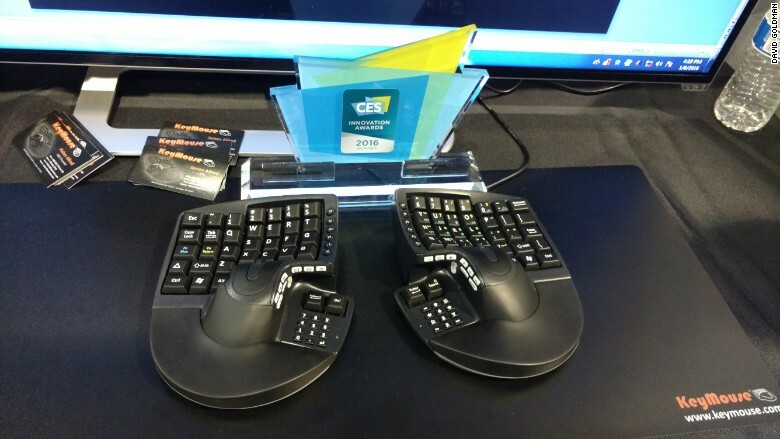 It's an ergonomic keyboard-mouse all-in-one! The aptly named KeyMouse is a split keyboard that fits your hands perfectly. Move around the two keyboard halves, and it becomes a mouse. The KeyMouse folks thought of everything. It has a mouse button at your thumbs. There's a NumLock button on the left that lets you convert the letters to numbers on the right hand. There are a bunch of programmable buttons that pretty much do whatever you want them to do. You pretty much never have to lift your fingers off the home keys using KeyMouse. But using it was a little tricky. The keys aren't exactly where you'd expect them to be, and my first few attempts at "The quick brown fox jumps over the lazy dog" came back a bit garbled. KeyMouse founder Heber Allred said it takes about a week to get used to the $399 keyboard. But once you do, your typing speed improves dramatically. 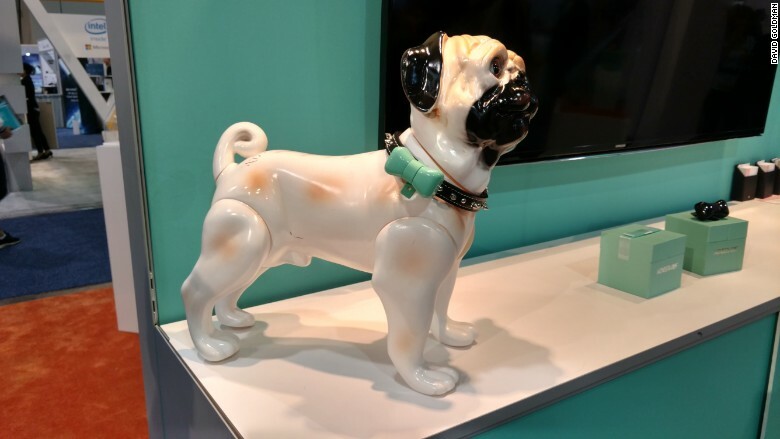 If you've been wondering where you could get a Wi-Fi-powered, bowtie-shaped monitoring device that tracks your dog's activity, sleep and even doggie dreams, then the WonderWoof is obviously for you. You can even meet other dog-obsessed people in your area with the associated app. We have machines to wash and dry our clothes, so why not one that folds them? The Laundroid does just that. Throw in an article of clothing, and Laundroid analyzes it, then folds it accordingly. From a demonstration video, it looks like it takes Laundroid takes about five minutes to fold a single item ... and it needs to be loaded with each item of clothing individually. So the future isn't quite here just yet. 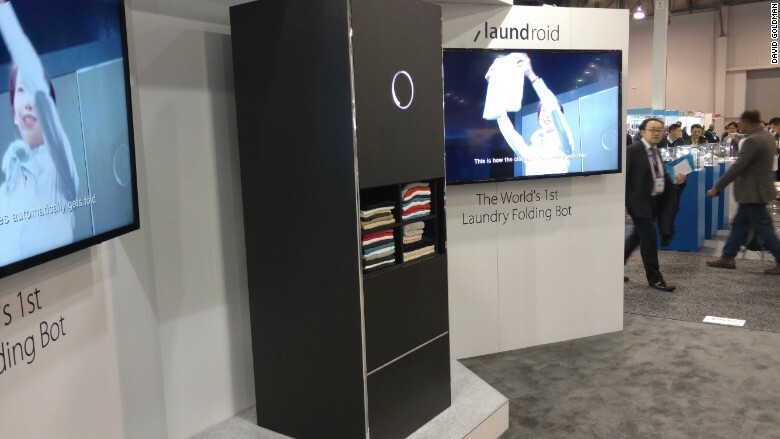 But the idea is that Laundroid will one day double as a closet or chest of drawers. Just dump your laundry in, walk away, and come back a half hour later to perfectly folded clothes. Guys, Google Glass was so three years ago. Copying Google's design and calling it "Telepathy" still isn't going to get anyone to wear it. Pregnancy tests are stressful. They take a few minutes to give you an answer and you could be devastated by the result. 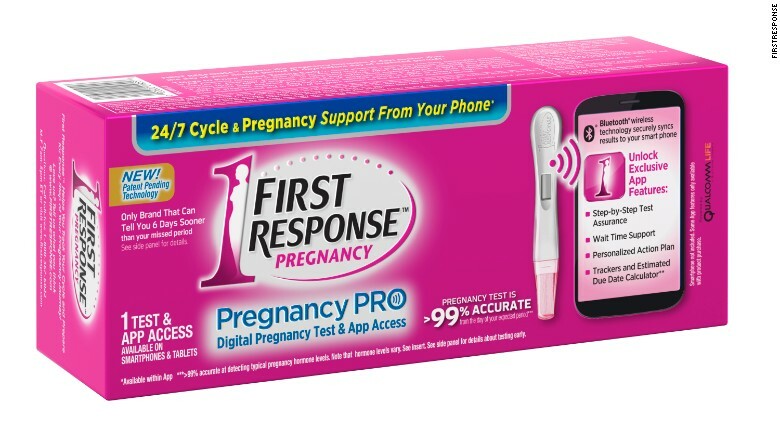 FirstResponse developed a Bluetooth-connected pregnancy test that it believes will take some of the stress out of the process. The connected app first asks you if you want to be pregnant or not. It will tailor the manner in which it issues a response based on your answer. As the results are coming in, the app will educate you, entertain you or even calm you down, depending on how you'd like to pass the time. When the result comes in, the pregnancy test will guide you through potential next steps. It's not reusable, but at $15 to $25 it's not drastically more expensive than other pregnancy tests on the market. 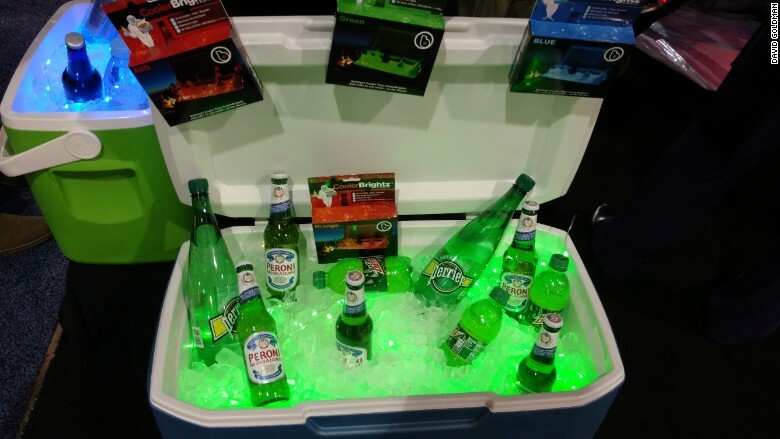 Sometimes, you want your cooler's ice to be lit up with a certain color. That's when you need CoolerBrightz, apparently, which retail for $10. Why get a manicure when you can get your nails printed? Manicures have always been more art than science ... until now. 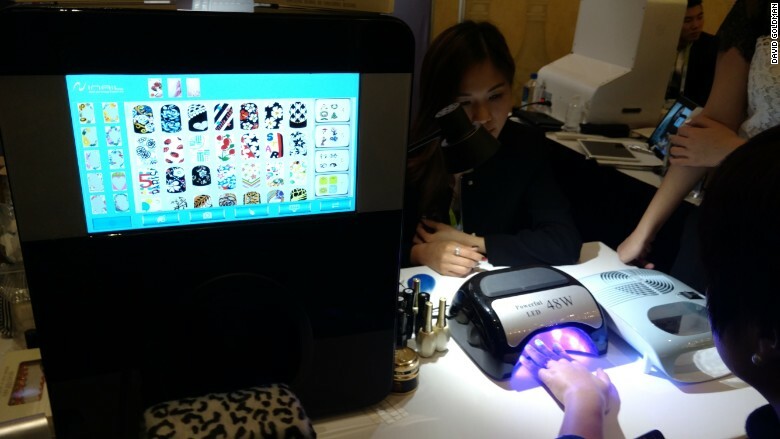 Vinail will print a pre-programmed design right onto your nails. Just stick your fingers into the printer. It glows purple for a few minutes, and then you have white nails with a red dragon printed on them -- or whatever floats your boat. Polaroid has been able to make a decent comeback by tapping into Gen Xers' nostalgia and updating its famous instant film cameras for the digital world. But the company also licenses its brand to a host of manufacturers, which make everything from Polaroid earbuds to Polaroid turntables. 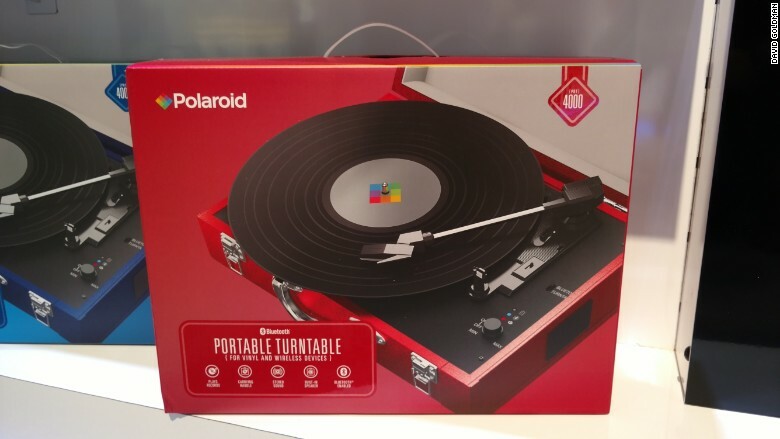 Polaroid's take on the turntable will transfer your records into digital music and connect to your phone via Bluetooth. Remember '90s clothing store Limited Too? It's back, but it's not just selling sparkly clothes for tween girls anymore. Now it's also selling sparkly phone chargers, cases and LED makeup mirrors. 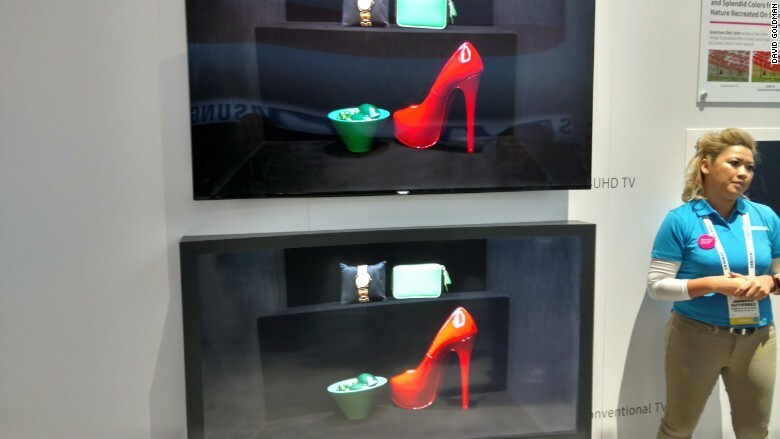 Samsung's older lineup of TVs (bottom) show reds that appear more orange than the newer Quantum Dot TVs (above). With a whole bunch of physics that are hard to contemplate, Samsung has designed a TV that really impresses with its amazingly true-to-life colors. The "Quantum Dot" technology replicates real-life colors, so blacks are more black, reds are more red, and greens are more green. In older versions of Samsung TVs, reds appeared orange, and greens appeared blueish by comparison. The new Quantum Dot TVs will debut later this year. How'd you like this display in your car? Screens in cars are becoming standard, now that backup cameras are mandatory. 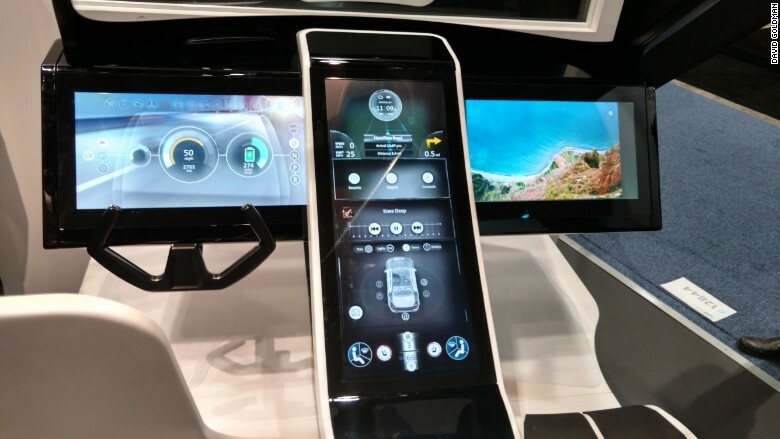 But glass-maker Corning envisions a future where screens aren't just part of your dashboard -- instead, your entire dashboard will be a screen. Corning's futuristic plan also includes putting Gorilla Glass on your windshield. That's the same screen that's on your phone. It's lighter and more durable than your current windshield, helping to increase fuel efficiency and clarity. It also showed off an impressively bright "heads up display" that was projected onto the windshield, showing turn-by-turn navigation and your current speed. Cars are becoming more like smartphones on wheels, but Corning is taking that idea to the extreme. 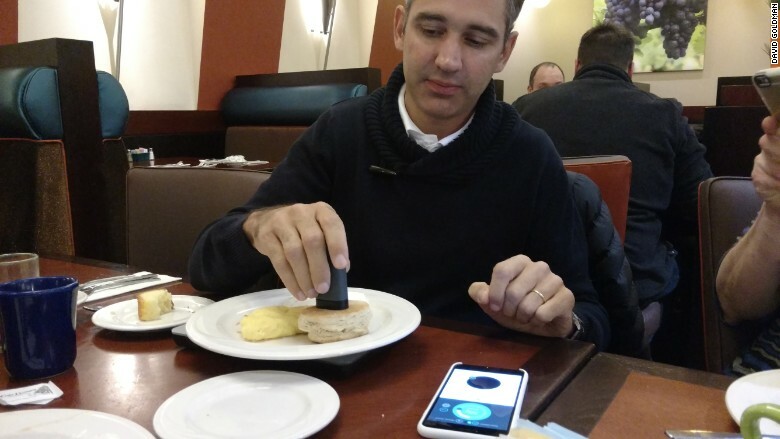 DietSensor CEO Rémy Bonnasse scanning the components of his breakfast. When Rémy Bonnasse's daughter was diagnosed with type 1 diabetes at age 9, he had to start closely monitoring her food intake. Food labels helped a bit, but there are no labels when you go out to eat. So Bonnasse developed DietSensor, essentially a massive database of food components that won a coveted innovation award at this year's CES. The corresponding app helps you measure your daily intake of food, making recommendations about what to eat -- and not to eat -- throughout the day, based on your particular health profile. DietSensor really becomes impressive when it's paired with Consumer Physics' $249 pocket-sized "Scio" infrared scanner and a Bluetooth connected scale. Put your plate on the scale, and hold the scanner to each food item on your plate. The scanner instantly measures how much fat, protein and carbohydrates are in your food, and the connected app figures out how much of each component you consume as you eat, in real time, as it leaves the scale (and enters your mouth). DietSensor has preset plans for individuals who are overweight, diabetic, have high cholesterol or heat disease. You can also enter your own daily consumption goals, based on your dietician's recommendations. Today, you have a choice between cable broadband Internet, which is expensive, or DSL Internet over your phone line, which is slow. But soon, a new technology will be coming to your home that will offer Google Fiber-like speeds right over your phone line. It's called G.Fast, and Israeli chipmaker Sckipio is showing off the powerful technology at CES this year. In a demonstration for CNNMoney, Sckipio showed off download speeds of nearly 750 megabits per second traveling over a standard phone line. That's 50 times faster than the broadband that you probably have coming into your home right now. 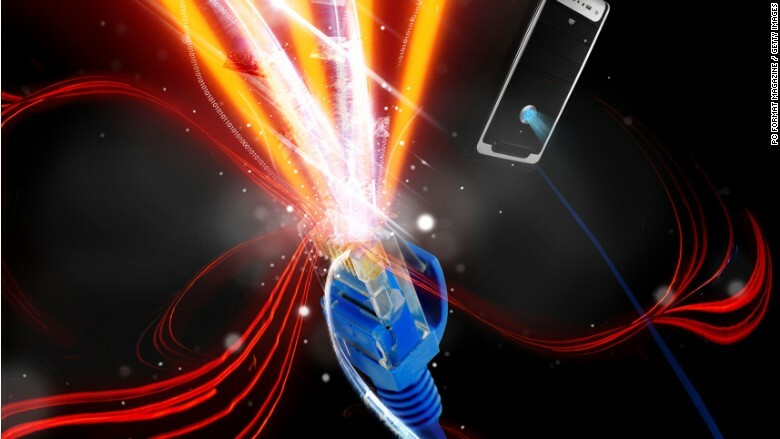 The promise of G.Fast is to offer an alternative to your broadband company. The technology will give your telephone provider the ability to offer even faster speeds than cable -- and they won't have to dig up holes in your yard to do it. Sckipio says the G.Fast technology will debut in the United States later this year. In a dig at T-Mobile (TMUS), AT&T Mobility CEO Glenn Lurie told CNNMoney that being the best wireless carrier is about more than having the lowest price. "From the time you get up to time you go to bed, you'll get an integrated experience with AT&T," Lurie said. "Your videos will work seamlessly with your phone, car or at work. All these inanimate objects around you will start to take care of you." 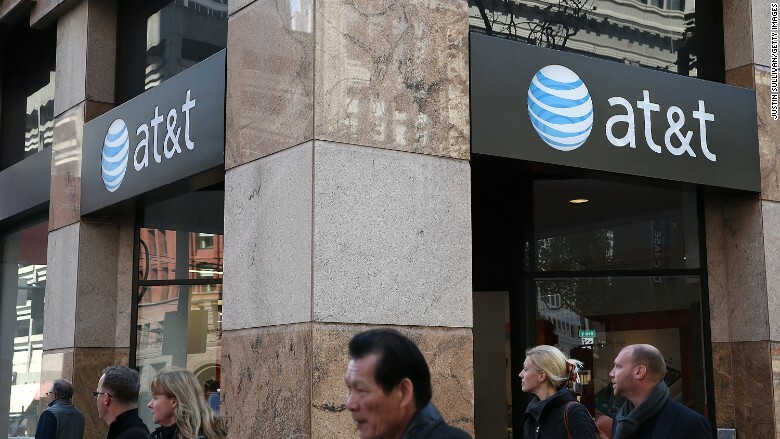 AT&T (T) is investing heavily in building up its Internet of Things offerings by partnering with the governments of Chicago, Atlanta and Dallas to make their infrastructure wireless. One day, Lurie says AT&T will let people in those cities know where traffic congestion is happening, where the nearest parking spaces are, when there is an emergency, and even whether their water is safe to drink. With AT&T powering DirecTV, wireless connections in cars and millions of smartphones, the company is developing massive scale that it says separates it from the competition. "It's not just about offering the cheapest service," Lurie said. "The others we're competing with are single-play players."